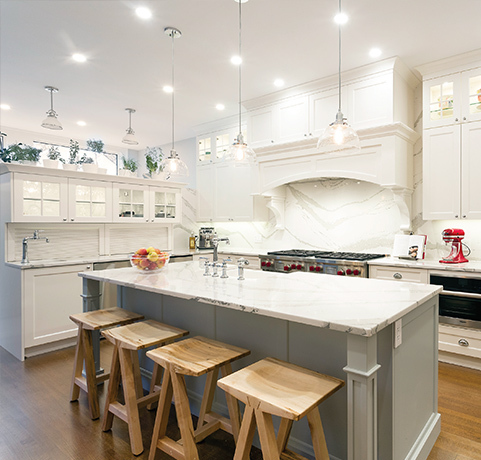 Looking back on their newly renovated kitchen and mudroom in their century old Crescentwood home, Elizabeth and Allan are glad they took their time in the planning and research stage. "We've been in the house for 7 years, and our planning has taken us 6 years but no regrets," says Elizabeth. "We wanted to live in the house for a number of years to get a feel for it and then start a renovation that reflects how we want it to function." "We had our own draftsperson that we hired separately in advance of finding a contractor so we had the full layouts already pre-planned." "Meantime, we were really scoping out other renovations in the area over those 6 years. Talking to other homeowners in the area, Wayne Sage of Harwood Builders kept coming up. So when the time came to launch the renovation, Harwood Builders distinguished themselves as the obvious choice and we hired them." With 11 foot ceilings in the kitchen, the couple knew they wanted to take advantage of the storage potential that presented, so no question that cabinets were extended to the full height but with one important exception. The cabinet wall on the mudroom side was set lower to allow the natural light from the south facing windows to illuminate the entire kitchen. The cabinet wall became a multi-functional station serving as a beverage and coffee area as well as instant bar when needed with necessary paraphernalia out of sight for a clutter-free counter. Another benefit, the top of the cabinet provides room to grow fresh herbs with a dedicated grow light set on an overnight timer. "There's chives, rosemary, thyme, basil always available," says Elizabeth. Harwood Builders provided the couple with their interior design expertise as part of their service package to create the sun-filled space Elizabeth and Allan wanted. Maple cabinetry painted in Chantilly White, sparkling Cambria Britannic quartz countertops and the expansive backsplash under the decorative arch was lined up for a seamless look that preserves the swoosh pattern that mimics granite. The island is fitted with a dishwasher and two fridge drawers that are kid's height for easy access. The back wall features a double gas stovetop and steam oven while the adjacent walk-in pantry houses the microwave, set at a reachable height for kids along with enormous storage capacity for foodstuffs and appliances. The mudroom, a few steps down from the kitchen, shares the common bar cabinet wall and is efficiently equipped for a family on the go. The area accommodates a utility sink for washing the paws of the family's 'large dog', footwear and jacket storage as well as room for cleaning supplies. Wayne gives insights into what it took to bring the plans to life. "Given this is a 100 year old house, restructuring it was quite a challenge, especially when another part of the project was adding a second story greenhouse to the structure above the kitchen. There was a lot of reframing done to bring it up to today's standards. Building a square plumb and level addition to an out-of-square, out-of-plumb, and out-of-level structure is very difficult to do. To make it work properly, one really needs to be very well experienced doing an extensive renovation to old homes like this." "While we work with a lot of great people, this couple was one of our favourite clients. Not only were they involved and educated in the process, they knew and appreciated what it took to accomplish our goals." Elizabeth and Allan rate their Harwood Builders renovation as a fantastic experience! "They were wonderful and addressed every question we had. We plan to have them back."